I love when bridesmaids wear colorful matching gowns. 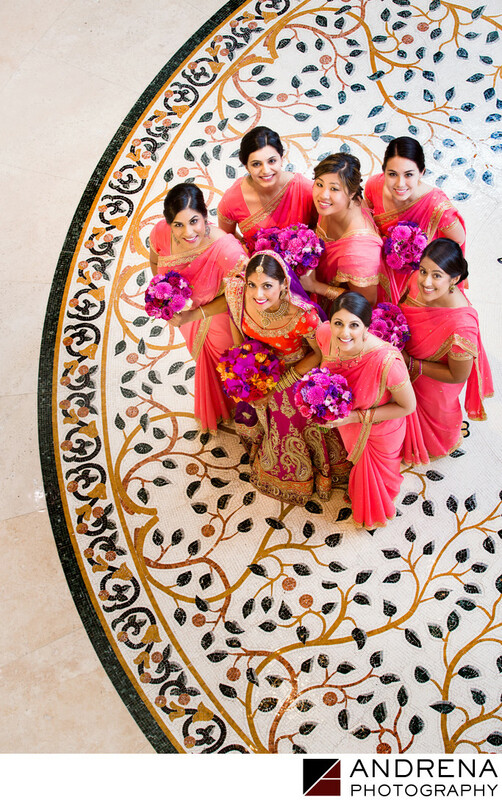 And for this Indian wedding portrait, the mosaic tile floor at the St. Regis Resort in Monarch Beach, California, provided the perfect backdrop to the colorful saris worn by this group of bridesmaids. I love using an aerial or overhead viewpoint when I can, and happily, the St. Regis has a high balcony that provides a perfect vantage point to create an image such as this. The light in this part of the St. Regis is nearly perfect at all times of day, so this section of the hotel is a favorite with photographers. From this photograph, you would never know that it was actually very foggy for the outdoor ceremony. The bright colors of the saris helped keep the mood fun, happy and festive during the ceremony. With florals by Bloom Box Designs and coordination by Nutan Shah at Elegant Events. Indian wedding photographed at the St. Regis Resort and Spa in Monarch Beach, California.